Arrival in Bogotá and transfer to the hotel. Exploration of the city by bike. Highlights of this tour are, among others, the colonial and historical center ¨La Candelaria¨, the Plaza Bolivar, such as the Gold Museum and the Botero Museum. Full day trip to the Chingaza National Park. Together with a specialized guide the surroundings will be explored by car and on short walks. The journey continues to the Coffee-Triangle. On the way to the Coffee Hacienda visit to San Francisco, Guaduas and Honda. Visit to a coffee plantation to learn everything about the production process from planting to tasting. Onward to Salento. On the way exploration of the Cocora valley and possibility to plant a palm tree. After the arrival in Salento, time to get to know the little town, before going on a trip to Filandia. Dinner at the local restaurant "Helena Adentro". Transfer to Jardin in the mountains of Antioquia. Visit to the villages of Jericó, known for its handicrafts and the manufacture of small leather goods, and Fredonia, to have lunch, visit a local coffee plantation, and get to know local gold miners. In the afternoon transfer to Medellín. City tour through Medellín to discover the history and present of the city. In addition to that a local graffiti artist will explain the meaning of graffiti in Medellín and show important artworks. Visit to a local social project. The projects visited depends on the availabilities of the organisations. The main idea is to contribute to the sustainable development of the community through a guided tour or activity offered by them. In the afternoon street food tour to try local delicacies. 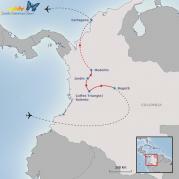 Transfer to the airport and flight to Cartagena. Upon arrival transfer to the hotel. The rest of the day is free of leisure. Bike tour throught the colonial center of Cartagena. Among others visit to the fortress of San Felipe and the Historic Museum of Cartagena. Ride to the fishing village La Boquilla. On a Dugout-canoe the guests glide inaudible through tunnels in the dense ancient growth of mangroves. Afterwards participation in a Coconut-Workshop to create natural and personal souvenirs. Time to enjpoy the village before heading back to Cartagena. Lunch included. End of the roundtrip. At the agreed time, transfer to the airport to take an international flight back home.